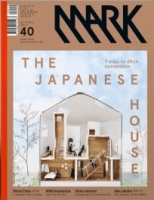 Introduction: Cathelijne Nuijsink left the Netherlands on a mission to understand the contemporary Japanese house. Shigeru Oshima: Misawa Homes’ ‘A Project’ features collaboration between the Japanese manufacturer of prefab houses and outside architects. Studio Velocity: Studio Velocity designed a cylindrical house with two floors connected by no fewer than four staircases. ON Design: ON Design unites man and wife in his-and-her houses. Hiroyuki Shinozaki: Hiroyuki Shinozaki designed a house like a series of bookshelves. Ma-Style: Ma-Style gives its clients a black cube that hides a bright interior. Suga Atelier: Shotaro Suga believes that sometimes a dense urban setting demands fortification. Akihisa Hirata: Akihisa Hirata designed a house with a continuously corkscrewing interior. Suppose Design Office: Suppose Design built a house in Miyoshi and sealed off the interior from the outside world.